The ProForm Performance 800i is one of the newest treadmills in the company’s lineup, first introduced for the 2019 model year. It becomes the new top of the line machine in the affordable series, and has features and capabilities typically only found on the more expensive treadmills, making it a very appealing choice. With rare decline capability and a 14″ touch screen display, the 800i is more advanced than most other entry level treadmills on the market today. Belt : 18" x 60"
Maximum User Weight : 315 lbs. Warranty : Lifetime for frame and motor, 3 years for parts and 1 year labor. One of the most talked about features on the new 800i is the 14″ Smart HD touch screen display, something rarely found on an entry level treadmill, if ever. Touch screens are typically reserved for the more expensive treadmills in a company’s lineup, but here you are getting one for under $700. You can see all of your workout stats clearly laid out or train in locations across the world with an endless selection of on-demand workouts. Another rare feature on any treadmill, let alone an affordable one, is decline training. The new ProForm Performance 800i gives you up to 2 degrees of decline capability on top of 10% incline. This allows you to take your training to the next level, targeting muscle groups that you just can’t hit otherwise while ramping up your cardio. Just like with a touch screen you usually have to pay hundreds more to get decline capability on a treadmill. For example, the ProForm Pro 2000, which has a touch screen and decline capability, is around $1,299, considerably more expensive than the 800i. The ProForm 800i comes with 50 built in workout programs, as does the newly redesigned base 400i treadmill. This includes a nice mix of incline training, high intensity intervals, speed, calorie burn and more. Whatever your fitness goals are, there is definitely a workout for you. And you can change things up from one workout to the next. 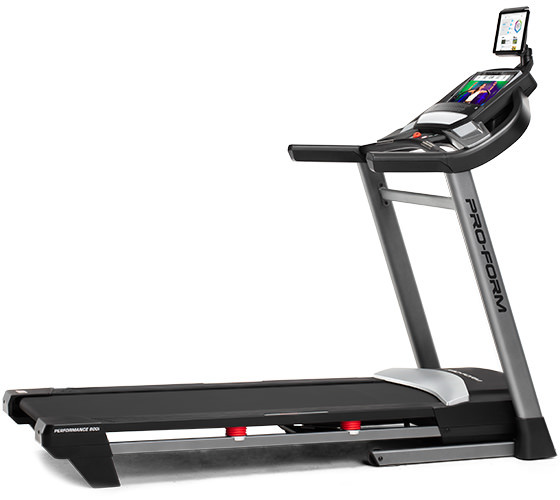 Like most of the ProForm treadmills these days, the new Performance 800i comes with iFit Coach. If you see the designation “SMART” in front of the name, this simply means that you get iFit for FREE for one year. What is iFit Coach? It’s a completely interactive experience that you can tap into right on the new touch screen display. As we mentioned above, you can choose from a wide range of on-demand workouts led by top personal trainers. You can also track and share all of your results, and get rewards for achievements. You can choose a location via Google maps anywhere in the world, and it’s as if you are actually training there, with the treadmill automatically adjusting the speed and incline to match. iFit Coach requires a yearly fee, but most users agree it’s well worth the price for all of the features and capabilities that you are getting. On top of the awesome touch screen, decline and incline, tons of built in workouts and iFit Coach technology, the ProForm SMART Performance 800i treadmill comes with plenty of extras. You get grip heart rate monitoring, a capable motor, speed up to 12 mph, solid ProShox cushioning, easy folding, workout fan, tablet holder and music/speaker system. It also comes with a very strong warranty, especially given the affordable price. Overall, the ProForm 800i is a very welcome addition to the company’s Performance Series. Let’s sum up the pros and the cons to help you decide if this one is the right treadmill for your home gym. There are certainly a lot of pros here, as you’ve read about above. You have a compact, folding treadmill with incline and decline, a 14″ touch screen, iFit coach programming, 50 built in workouts to choose from, heart rate monitoring, a fan and music. That’s a ton of features on one treadmill, especially one that doesn’t cost thousands of dollars. It has a good motor, is well designed and is backed by a very good warranty. There are not too many drawbacks here. If we had to pick something, it would be the width of the running surface. Some of the previous Performance Series treadmills had 20″ wide belts. We’re not sure why the new 800i, which is the top model in the series, would have an 18″ wide belt. But it might just be that ProForm is trying to make the entire series more space friendly, as the demand for compact treadmills increases. So taller users may find the belt a bit narrow…but for average sized individuals this shouldn’t be an issue. If you’re in the market for an affordable treadmill for walking and jogging, the new ProForm Performance 800i is definitely a great choice. You get the very uncommon decline capability and advanced touch screen display, among other great features and extras. However, if you’re more of a runner or there will be multiple users, you may be better off with one of the up-level Power or Pro Series treadmills. Those machines will give you a larger running area, stronger motors and a bit more durability. But for walking and jogging, you’d be hard pressed to find a treadmill with more features for the price. This one is a winner that is definitely worth considering.